For those unfamiliar Sword Art Online II is the sequel to Sword Art Online, which was released by Manga Entertainment UK onto Blu-ray and DVD, and sees Kirito once again within a virtual reality game trying to uncover the mysteries surrounding players dying within the game. This UK release of Sword Art Online II, which was handled via ANime Limited, saw the series released in four seperate parts each of which were available as a Collectors Edition combo pack, which is what i will be unboxing, and standard edition DVD; furthermore each Collectors Edition release not only came packaged inside a unique chipboard box but it also saw a variety of information packed neatly inside a booklet. With this being said; let’s get straight to the unboxings! The inital print-run release of Sword Art Online II – Part 1 came with a rigid chipboard artwork that would hold all four parts within it to offer the impression that you had a complete series boxset; unfortunately as this was limited (I believe to 1,000 units) then you will unlikely be able to find it new unless someone is selling it on eBay or privately. In regards to the Part 1 set then inside viewers will find episodes 1 to 7 on both Blu-ray and DVD packaged inside a digipack case alongside a booklet featuring detailed information and artwork relating the episodes contained within this instalment. 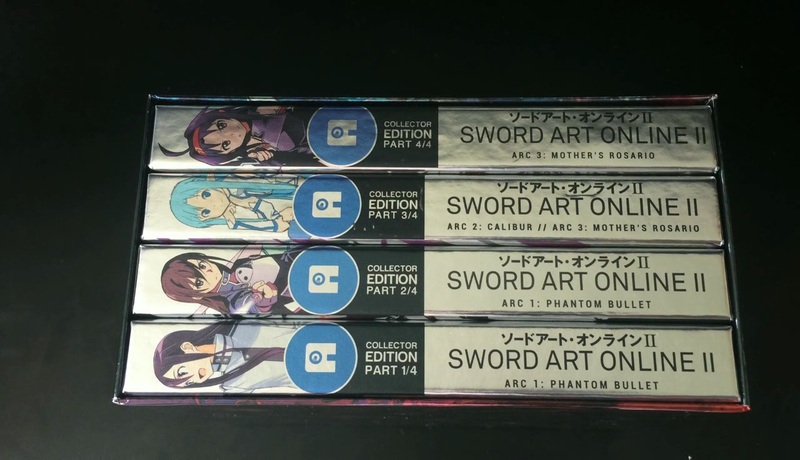 Future volumes of Sword Art Online II did not come with any ‘collectable’ perks and as such will be received as standard in Collectors Edition packaging. Yet again fans will find both the Blu-ray and DVD disc, both of which contains episodes 8 – 14 in English and Japanese audio, packaged inside a digipack sleeve alongside a booklet featuring information about the episodes featured in this set. The third instalment, which consists of Calibur and Mother’s Rasario Arcs, remains the packaging design seen within the first two volumes; with both Blu-ray and DVD discs packaged in a digipack sleeve alongside a booklet that slots into the collectors packaging. Once again numerous artwork can be found, such as on both sides of the box and digipack, but this time the artwork of the disc is slightly different with both Blu-ray and DVD opting for different colour designs. The fourth and final instalment once again returns traits laid out in the previous parts, with both Blu-ray and DVD discs included alongside an booklet that features artwork and information related to the episodes contained. Unfortunately however Anime Limited seems to have made a mistake on this instalment of the series as the spine features slightly different lengths and placings when compared to the rest of the series; a mistake which ultimately becomes clear when the entire colleciton is put together – as seen in the picture at the top. Overall as a fan of Sword Art Online then I really do like these Collectors Edition packaging; my only gripe would be the reflective design – which makes them near impossible to take pictures – as you can not clearly see the impressive artwork that is on display. My gripes with digipack and chipboard artboxes remain, as over time they will get damaged if you wish to continually watch the product you have purchased; and finally when sloting the sets into the artbox the contents of each part can slip out – yet again another design flaw by Anime Limited. Despite my gripes these Collectors Edition releases of Sword Art Online II would make a fine addition to anyones Blu-ray collection; and thankfully now are now available within the UK!